I am currently reading PUSH by Chalene Johnson, creator of Turbo Fire, Turbo Jam and ChaLean Extreme workout programs. Her book is a 30 day program to help readers achieve goals related to both fitness and life in general. Each chapter is meant to be one day of “homework” which typically involves setting goals, making lists and thinking about what you really want from life. 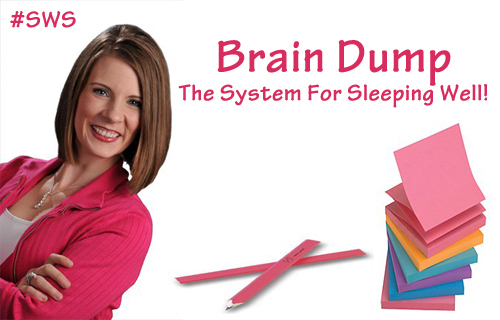 One of the ideas Chalene gives is to do a “brain dump” prior to going to sleep each night. The “brain dump” can include the next day’s to-do items, your goals and ideas you have floating around in your mind. This process is supposed to help clear the mind to help reach a lower level of stress and a higher level of relaxation. Although she is not the originator of the idea, I still think it’s a good one. Last night, I tried the “brain dump” method for the first time. My list focused more on goals and dreams, somewhat related to the teaching of the book The Secret by Rhonda Byrne. I wrote a mock journal entry; one that I could see myself writing in a few months when I’ve hit several of my goals. I expressed my gratitude for achieving those goals I had previously set on my PUSH homework sheets. What I didn’t expect was the amazing sleep quality I had last night. I am typically awake, rolling things around in my mind for a little while after getting in bed, before I actually fall asleep. This time, I was literally out the moment my head hit the pillow. It was only 11 pm and I wasn’t any more tired than normal. This morning, I slept right through my alarm. The sound of my mom’s high heels clicking on the hall floor is what made me realize I had overslept. However, the really odd thing was that I didn’t spring out of bed and rush around with my heart pounding out of my chest like I would normally do in such circumstances. Instead, I got ready for my day as I usually would (though I am glad I had set out my running clothes for this evening and clothes for work before bed). My commute was uneventful and I didn’t even yell or swear at any other commuters (trust me, this is a big deal). I just felt very Zen. I was 15 minutes late for work, but I’m still feeling very content and relaxed. At this point, I can’t be sure how much of this is related to my “brain dump” last night and how much is just because I had an evening of relaxing and doing what I wanted (pizza, tv, a hard workout and laundry). I do know, however, that I plan on trying this again tonight. My plan is to experiment with the “brain dump” process for at least a week to see if it really affects my sleep quality and the following day. This time could have been a fluke, but I guess only time will tell. I would like to think that with how successful Chalene Johnson is that there might actually be something to this! Anyone else up to giving this a try?